We all experience these up and down cycles — and we all try to maximize the former while minimizing the latter. But the Wheel of Fortune tells us that both are necessary and that the good times wouldn’t be good without the frame of reference of the not-so-good times. In traditional (Rider Waite and Golden Dawn) style versions of this card, there are more ominous connotations of those up and down times, but as this deck was designed for children, the imagery is more positive, playful and whimsical. We see a roulette wheel in the center with four sets of lucky symbols — hearts, 4-leaf clovers, horseshoes and brass rings — and eight sets of numbers around the perimeter. The “eight” theme is repeated there in numerical increments as well. 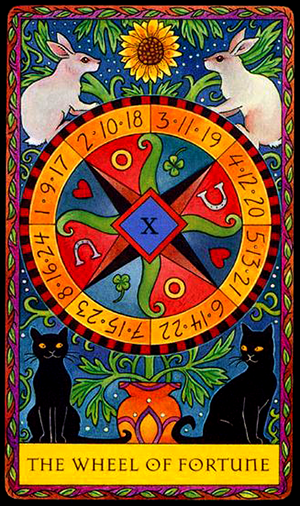 Rounding out the imagery is a pair of lucky white rabbits at the top of the card and a pair of unlucky black cats at the bottom. If you’ve been feeling low or find yourself in the midst of a “down cycle,” remember that things can only get better. And if you’re riding high now and find yourself at the top of your game, remember that it’s the entire spectrum of experience — both good and bad — that’s allowed you this perspective. Today’s tarotscope — the Wheel of Fortune — is part of the child-friendly Amazing Fortune Telling Cards book-set by Karin Lee (author) and Kipling West (illustrator). Check out more of Kipling West’s designs available for purchase through Image Kind.